What has heritage ever done for us … on Saturday 20 June was an excellent and well-attended event, with thought-provoking talks and discussion. Helen Graham invited me to write a piece in advance of the event, to contribute to the mix of views represented. Seems sensible to include it here, so here it is. I’m one of those York born and bred people. I know we can be annoying when we go on about this, and that we can make other people who’ve moved here more recently feel like they’re not accepted and don’t belong. I don’t want to do that, but I do have to write from the perspective of someone who has lived here for 40-plus years. Heritage is what we inherit. And if you’re born in a place and live in it for decades then you have a weightier inheritance to think about, assuming you’ve grown to have attachments and understandings about the place, as most of us do. I’m thinking not just of the built heritage but of a cultural heritage too. Concerns about the protection of heritage are often dismissed as ‘fear of change’. I’ve often thought, if I did fear change as much as members of the ‘heritage brigade’ are accused of doing then I’d be cowering in a corner silent and terrified by now, as there’s been so much change. York-born people of my generation and older have seen enormous changes in recent decades. The factories where so many people worked when I was a child are now part of our ‘heritage’ rather than workplaces. The city turned towards tourism and welcomed visitors, more recently it has seen a massive increase in the student population and residents who have graduated from the universities. This has changed the feel of the place quite dramatically. It’s most noticeable probably in the Walmgate area, where we now have the interestingly named ‘Student Castle’. This has resulted in tension and difficulty between opposing perspectives, the ‘new stuff’ and the ‘old stuff’, those who want to make their mark on the city and those who want to protect its heritage. I’ve found it troubling the way heritage and ‘new stuff’ have recently been set up as if in opposition by members of the growing creative sector. Heritage is often portrayed as some dull dusty thing getting in the way. The UNESCO designation as a City of Media Arts and associated plans for the Guildhall provoked particularly heated debate, emphasising the divisions between different communities within the city. “The proposal for the Guildhall complex is part of a bigger picture and demand being pushed through the city by the creative sector” said an article in oneandother.com. The UNESCO designation is “about York pushing forward” suggested a recent piece in the Press. There seems to be quite a lot of pushing going on. It’s no wonder some of us feel a little concerned, and fear that the things we care about will be pushed out of the way, destroyed or silenced. Recently on Twitter I noticed a photo taken in Beverley, in East Yorkshire, some decades ago. 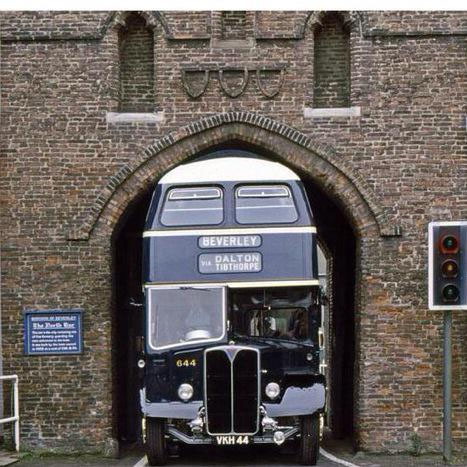 A photo of a bus going through Beverley’s North Bar. The bus had a really unusual shape, at the top. Not flat and wide, but with the sides of the roof at an angle, forming a more pointed roof. The roof matched the shape of the North Bar’s opening and allowed the buses to go through it. A solution to heritage being ‘in the way’ of the needs of 20th century life, an imaginative and thoughtful one, and a local one. There’s a message there for those wanting to drive through change in York. I hope that they’ll take their journey through the city with more respect for what’s already there, shaping their changes more sympathetically to the solidity that came before, the distinctive shape of what’s already there, rather than driving through change regardless. For the future, I would like to see us broaden our awareness and appreciation of heritage to include the places and experiences perhaps more resonant to groups of people currently under-represented in the many dialogues about the city’s heritage. Many voices remain unheard. 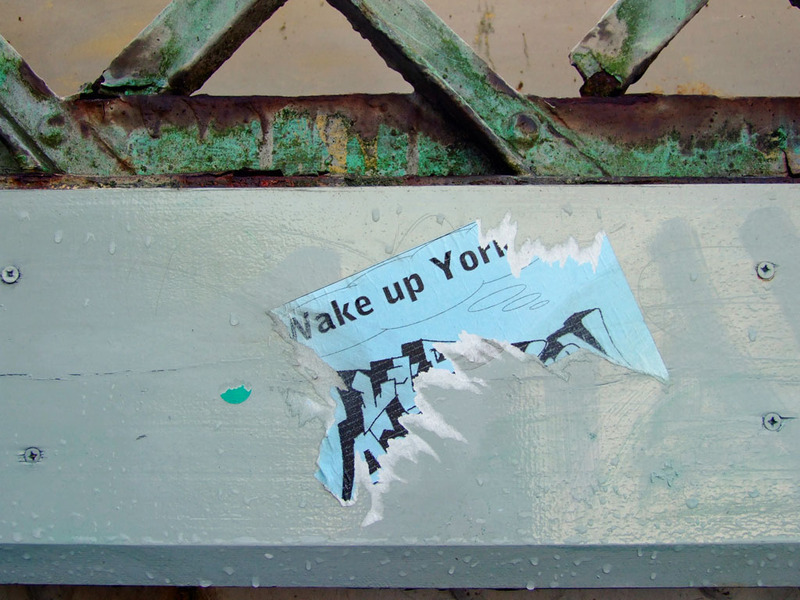 It’s clear that those who know how to get support and funding will have a clear advantage, and that there are many people left on the periphery unable to influence decisions on heritage or have their stories and experiences recognised as part of York’s story. I fear that the dominant narratives will end up wiping out or obscuring the local distinctiveness, ignoring what is already known. A challenge for the future is to make sure that the less visible heritage and the quieter voices are recognised and recorded. The quieter voices are always welcome here, have been recorded here for many years. If you’d like to help support this site that would be much appreciated. By Lisa @YorkStories • 22 June 2015 Opinions, thoughts To link to this page's proper location please use the > permalink. Very pertinent comments and I understand entirely how you feel. I hope you don’t consider it impertinent of me to suggest that your sentiments will ring a bell with many who are approaching (though in my case leaving at the other end) middle age, when the landscape of our youth, physical and otherwise starts to become unfamiliar to us. It makes us feel uneasy and what is important to us undervalued. Don’t underestimate the brilliant job this site does in recording and keeping alive the lesser known and celebrated heritage and culture of York, as well as speaking up in a quiet, yet passionate voice for the distinctive nature of the city. I was struck by the mention (with positive and negative results no doubt) of the increase in the student population over the past half century and particularly since the 90s. It has definitely changed the vibe of my local city of Norwich, which has also transitioned from manufacturing to a more service and tourist based economy. I read recently that the student population of Oxford at the old Poly now Brooks, has increased from 5 to 20,000 in the past twenty years, with little or no planning as to where these students should live, or their impact on local services. In the end it is about new residents and younger generations respecting what has gone before and building on it organically by preserving its essential core, whilst also making their mark. In my experience it is often newcomers to a place who are keener on upholding local heritage than some of the folk who have deeper roots there. Thanks for this thought-provoking article and for seeking to represent the views of those whose voices are often ignored or unheard. As Christopher Alexander showed in his seminal work “A Pattern Language”, the places we accept and feel comfortable in have been shaped by us gradually. Today, the technological imperative (‘it exists, so we must use it whatever the consequences’) leads all too often to tabula rasa proposals on a massive scale, with no thought of integrating what is there, or using it as a starting point. Instead, older buildings become a ‘heritage offer’ and either set in aspic as museums or are knocked down. Of course what we see as old is the accumulation of hundreds of years of accretion and development, not some sort of holy ‘finished’ design. Money is the driving force, and the quieter voices you mention are drowned out by the strong discourse of growth and profit. Tourists are favoured at the expense of residents. On visiting the Council building, we go in at the ‘customer’ entrance. When did we become their clients, instead of them being our representatives?